New Light for Adventists – Trinity or Anti-Trinity? Dennis Priebe recently preached a sermon about the Trinity where he labelled the anti-trinity movement in the Seventh-day Adventist church as “new light”. [1:31] these new ideas carefully and that is exactly what Ellen White said we should do. [1:41] and they have come up with ideas new to Adventism. [5:55] to the section that we are going to be dealing with right now. [5:59] And that is the Trinity. Dennis Priebe, New Light for Adventists, July 21, 2016 at the Hartland Summer Campmeeting in Rapidan, Virginia, USA. Question: How would a person go about researching the claim that the anti-Trinity movement in the Seventh-day Adventist church is new light? Answer: One way would be to find out what our church’s flagship publication, the Review and Herald historically said about the topic of the Trinity at the official archives of our church – SDA (astr). 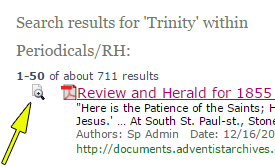 Note: After you visit the archive website click on the magnify icon (see yellow arrow) and this will then highlight where the word Trinity is found in the periodical. Please research what our pioneers taught and said about the Trinity. Read the articles and see for yourself the reasons why they believed the way they did. Were their points reasonable and relevant for today? Question: What was the pioneers belief about God? After researching the archived Review and Herald and Signs of the Times periodicals what did you find? The weight of evidence reveals that our church pioneers rejected the idea of God being a Trinity, whether it was a Catholic Trinity, a Protestant Trinity, or the so called Seventh-day Adventist Trinity. The pioneers viewed God as a personal being and not a unity of 3 coeternal Persons. It’s confusing when Dennis Priebe says the anti-trinitarian movement is new light. Our church officially accepted the doctrine of the Trinity back in 1980. Would it not be more accurate to say that the Trinity doctrine is the new light rather than the non-trinitarian doctrine of God? We as a church body have been believing in the Trinity doctrine officially for only 36 years. Our church officially started over 153 years ago. For over 117 years we officially did not believe in the Trinity. Non-Trinitarianism in the SDA church was the standard position for a very long time. This position is not recent in origin. For more information on the history of non-Trinitarianism in the Seventh-day Adventist church visit the Prophet Still Speaks website.